Cardoon, Cynara cardunculus, is a medicinal food high in folic acid. Similar in appearance to Globe Artichoke and culture, but the young stems and flower stalks are eaten. Gentle liver stimulant and laxative. Cardoon is native to the Mediterranean and prefers rich soil in a sunny position. Herbaceous perennial, growing to 2m x 1m. 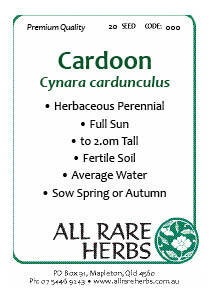 Be the first to review “Cardoon, seed” Click here to cancel reply.